On Saturdays I like to escape for a few minutes and head to the Salvation Army Depot (thrift store for any internationals) around the corner from my place. During my university days many, many moons ago I used to like going to thrift stores to find some cool, retro clothing. But through the years I had forgotten about them until some of my fave blogs reminded me of their jewel-worth. My local thrift store has specials every Saturday – generally half price on any particular category. Today it was books and bric-a-brac which was perfect for me as I was on the hunt for a music book. I have a craft project in mind that requires some music sheets to be chopped up. I found some lovely sheets of music at Reverse Garbage the other day for $3 but I wouldn’t have the heart to cut it up. I needed something less precious. I found two books today plus a book about Renoir and a pattern for kids shirts (perfect!). So here are my finds at a total of $8 for the lot. I love the “Italian Favourites” one, it has O Sole Mio and That’s Amore (love the Dean Martin version) – it’s so kitsch it’s cool. 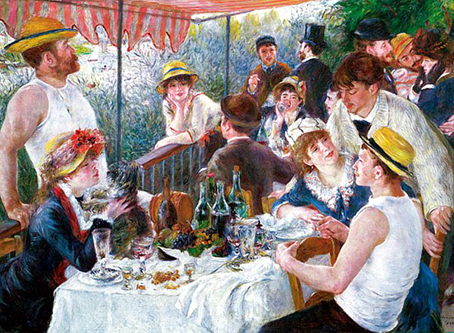 This is my all-time favourite Renoir, Luncheon of the Boating Party. And this is my Saturday (hubby made lunch – love him). Husband's hairy hand, not mine.